Mushrooms of Hawaii, More Mushrooms! Since we have been studying mushrooms and exploring amateur mycology for a few years, it follows a natural path that we would like to hunt mushrooms while on vacation. 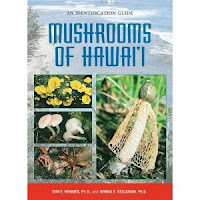 We usually head out to a warm and tropical location during the middle of a New England winter, so we did a little research into the fungi of our destination, the Big Island of Hawaii. A good deal of the fungi on Hawaii are alien, introduced with vegetation and soil from other places, therefore, many of the mushrooms are familiar to us. 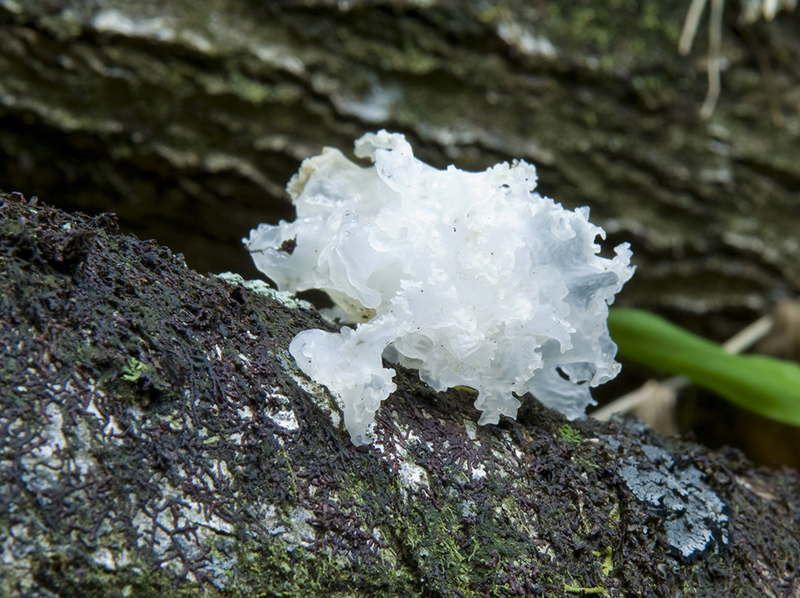 Only an estimated 17% of fungi are considered native Hawaiian species. 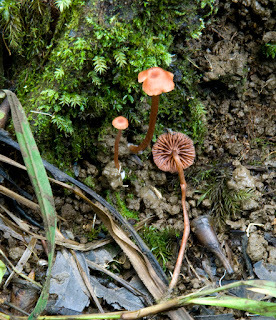 Fungi can be found almost all year in the subtropical environments, but the more abundant season is from July through January. Fallen palm leaves and casuarina needles, along with dead wood, coconut husks, lawns, and compost piles of mulch are all good places to look for fruiting mushrooms. 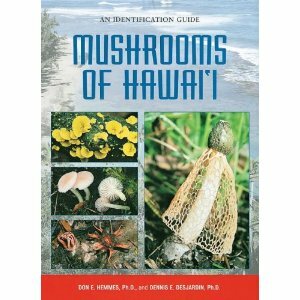 We purchased Mushrooms of Hawaii by Don Hemmes and Dennis Desjardin to help us identify the mushrooms we hoped to find. Upon our arrival to the Big Island in December, we were a bit worried to hear they were experiencing a significant drought. I contacted Don Hemmes, the author of the mushroom guide to ask him for some advice about where to possibly find some fungi. He graciously offered to take us to MacKenzie Park in the Puna district, along the southeastern coast, to do a quick foray. Although he does not teach biology full time at the University of Hawaii Hilo any longer, he still visits many sites and records the fungi present on a monthly basis. Don still participates in and contributes to the study of fungi on Hawaii on the Fungi of the Hawaiian Islands website. We braved winding one-lane roads, rain squalls, and lava tubes to take a walk and find some mushrooms, including the Geastrum litchiforme, the lychee earthstar, and a poisonous Amanita, Amanita marmorata. We also looked for fungi on our own on every hike we took into a forest. We visited the Kipuka Puaulu Bird Park near the Volcano National Park, and found some very large Scizophyllum communes, along with many slow growing conks. In the Waipio Valley, we found a log covered in Corprinus disseminatus and Earliella scabrosa shelves. Further up the coast in the Polulu Valley I came across rather large oysters, Pleurotus species growing from a fallen log on the trailside. At the bases of many of the casuarina trees we found the casuarina conk, Phellinus kawakamii, growing slowly and rotting the ironwood trees. 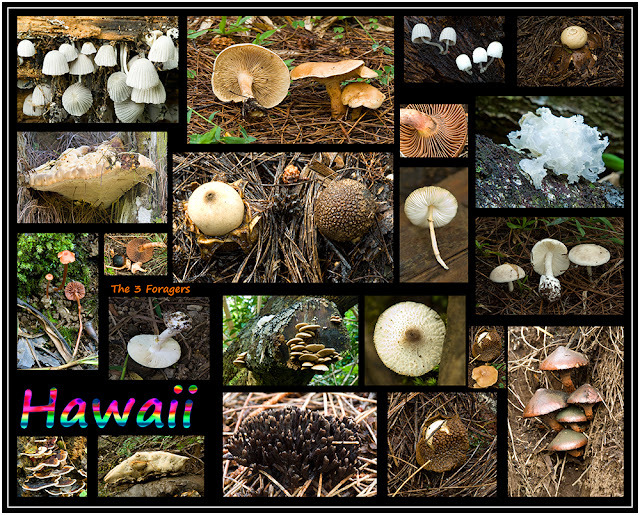 While we may have wished our vacation would never end, we did manage to meet a fellow mycologist and hike in many of the Big Island of Hawaii's forests looking for mushrooms. It would seem that myco-tourism is part of our future, since we are enjoying the fungi that we encounter on our travels. After a year of saving our dimes and dollars, we made another trip to the paradise of Hawaii, this time to the Big Island. The island is quite large, so we spent our time doing a lot of driving through the distinct climates: between tropical forests, coastal beaches, active volcanoes, and barren high altitude dormant volcanic mountains. We encountered many of the wild edibles that we found on Maui and Kauai, such as coconuts, starfruit and noni, breadfruit, and guavas. Most of our daily fruit bounty was picked up at the many local farmer's markets, where the assortment of tropical fruit was dizzying, and the prices were insanely low. We sampled many new fruits, made lots of fresh smoothies, and ate very well on vacation. We even stopped at every roadside honor stand, buying macadamia nuts, tiny limes and giant grapefruits. The availability of fresh fruit on the island is wonderful, as we re-tried many favorites and managed to buy and forage a few new wild edibles. While on the southwestern coast, we stopped at the Amy B H Greenwell Ethnobotanical Garden in Captain Cook. This garden is a wonderful resource to learn about the Hawaiian people and the plants they grew and used. There are 200 endemic, indigenous, and plants introduced by the Polynesians featured in 15 acres of gardens, most of them labeled and described in detail in the guidebook that you borrow from the front desk. Many of the plants in the garden had multiple uses as building material, food, and traditional medicine and had spiritual significance. It was at these gardens we were first introduced to the edibility of screwpine keys. The screwpine (Pandanus tectorius) is called hala in Hawaiian, and is likely indigenous, arriving from Pacific islands over ocean currents.It was a very important plant to the Hawaians, the spiny leaves being used for weaving and thatching, and the "keys" of the fruit for paint brushes, as food, and for a medicinal mouthwash to treat thrush. The tree is palm-like, with the leaves arranged in a spiral around the stem, and having many prop-roots at the base of the trunk. They are often found at the coast along beaches, but also along the edges of steep cliffs. The female trees bear large fruits that look a bit like pineapples or pine cones, with seeds that break off in many segments. As the fruit ripens from green to yellow to red, the "keys" fall to the ground. Each key has a bit of starchy, edible pulp attached to some very tough fibers, and the flavors ranged from sweet to mildly sweet, to potato-like. The fibers left behind once you used your tooth to scrape off the pulp were used as paintbrushes by Hawaiians, and it is easy to see why. The screwpine key was a new wild edible for us, and one we would eat again. Passionfruit (Passiflora species), known as lilikoi, grow very well on the Hawaiian islands, and there are several species available for purchase in the farmer's markets. They ranged from light yellow and large, to dark purple and smaller. Previously we had found an invasive type, the banana poka (Passiflora mollissima), on Maui. The banana poka is also invasive on the Big Island, and the vines can be found growing at higher elevations among the cloud forests of Kona. While down in the Puna district at the coast, we came across a smaller, bright yellow variety of passionfruit growing among the coconut trees. It was very delicious, with bright orange pulp. At one of the cottages we stayed at, there were passionfruit vines in the trees and we gathered the fresh, ripe fruit every evening when we returned. Passionfruits make beautiful and elaborate flowers, and grow on twining vines using curling tendrils. They are often found first in the wild by spotting the fallen fruit on the ground, and very often growing on roadsides by spotting the crushed fruit on the ground. Passionfruit are definitely one of our favorite wild foods to be found on Hawaii.